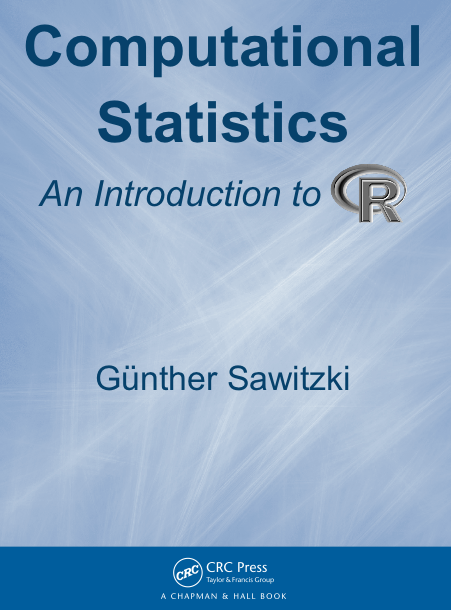 Günther Sawitzki: Computational Statistics: An Introduction to R.
Chapman & Hall/CRC Press, Boca Raton (FL), 2009. Course material and supplements for a compact course on computational statistics, including an introduction to R.
Supplement (including complete appendix) 30. Dec. 2011. R Profiling and Optimisation(Slides, 8up) 03. Apr. 2012. The R software and additional material can be downloaded from the CRAN repository. A previous German version is Einführung in R. This version will stay available in the CRAN archive, with kind permission of Chapman & Hall/CRC. For the project summary page see here. Contact information is available on the author's home page. Slides of a talk given at the meeting on Statistical Computing, Reisensburg 2009. R Source code for all examples, by chapter. For more information, see R profiling and optimisation (pdf). This book is designed to be a practical guide to the R programming language. The R Journal is the open access, refereed journal of the R project for statistical computing. It features short to medium length articles covering topics that might be of interest to users or developers of R.
A collection of graphic examples. A collection of links, mainly for graphic examples. The title says it. Please feel at home. Welcome! $Rev: 256 $ Updated 2014-06-06 by gs.